Stuart has ministered God’s healing to the brokenhearted and emotionally imprisoned for over thirty-five years. He has personally witnessed thousands of people open their hearts to perfect love, receiving spiritual, emotional, and physical healing in return, and has seen this love bring comfort and healing to the addicted, depressed, and survivors of traumatic events. Stuart’s first book, Perfect Love Heals, was published in 2014 and he is now working on his second book. 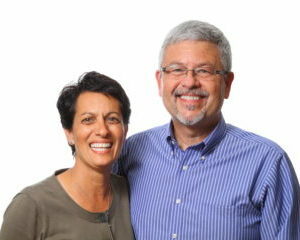 Shereen has ministered alongside Stuart in the area of emotional and physical healing for most of her adult life. She has been on staff since 2010 and serves Rick and Lori Taylor as their assistant. Together, their passion is to watch Jesus and His perfect love transform people and their lives. Stuart and Shereen live on the Central Coast of California and are the proud parents of two amazing young men, David and Daniel.